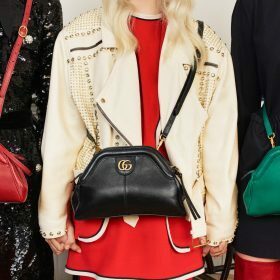 It's a new season, and with that brings the most desirable trends from Gucci - featuring chic luxury handbags, suave shoes and a wide and enticing array of accessories and dresses. This season is for the rebel, and forever the trendsetter, Gucci has incorporated the must have animal print trend alongside the Gucci emblems we know and love. My personal favourite is the new Re(Belle) shoulder bag, crafted from supple natural grain leather in gorgeous Gucci colours and prints. Don't miss out on these incredible pieces, shop now - regret never!